With dance filling our venue this week with FIVE, we thought it would be a wonderful time to highlight the benefits of movement for children and young people in and out of school. Before working for Theatre Hullabaloo, I trained as dancer and worked within the dance sector for 6 years. During this time, I witnessed just how powerful dance can be for young audiences. Both of FIVE’s two dancers, Darcy & Jake, have been lucky enough to experience high-quality dance training as graduates of two of the UK’s top conservatoires – Darcy from Rambert School of Ballet and Contemporary Dance, and Jake from Northern School of Contemporary Dance. In schools, dance is a compulsory activity within the National Curriculum for PE from Key Stage 1, 2 and 3 (ages 5 – 11). It is also regularly offered as an after-school activity. As a school subject or elective hobby, dance is unique in that it blends artistic practice with physical activity. I’ve seen first-hand the positive impact dance can have on young people’s education and learning, offering them not only a form of creative way to express their identities and cultures, but also opportunities to perform in school and in local, regional and national events. High-quality dance can even influence the culture of a school, promoting whole school improvement by raising aspiration and enhancing the profile of the school within its community. Dance remains one of the most popular art forms amongst young people. Socially, it enables students to gain artistic skills, improve their discipline, and help develop their abilities in physical interaction, team working, problem solving, observing, evaluating, verbal and non-verbal communication, and more. Collectively, dance has the power to improve self-esteem and widen aspiration on a largescale. What’s more, it can even help with national health issues such as tackling obesity in young people. In primary schools, the School PE and Sport Premium has had a positive impact on young people’s access to dance. An independent report, carried out by NatCen Social Research and published by Department for Education in November 2015, demonstrated that the funding has been used by schools to increase dance provision, with the activity being one of the most commonly mentioned new activities in the PE curriculum since the introduction of the premium. The continued study of dance in secondary schools provides young people with a positive, lifelong relationship with the arts and physical activity – this is particularly important for girls and young women who may be resistant to participating in competitive sport, prone also to issues of self-esteem. Boys and young men benefit too, with those who may never have been exposed to dance or given an opportunity to engage with it, able to enjoy and experiment with the practice within a school environment. So how can we extend the positive influence of dance to more young people? Governors and senior leaders can be key advocates for access to high-quality dance in their schools, and ensure it remains an entitlement within the curriculum. Beyond schools, parents and carers can play an important part in children and young people taking part in dance classes, watching dance performances and ensuring they gain the benefits from this discipline. Watching dance is an active process. It can inspire, motivate, widen aspiration and provoke ideas for creating. It provides insights into different ways of dancing, making and producing dances. FIVE exemplifies this, showing a range of movement vocabulary and style that portrays the five human senses of sight, hearing, taste, smell and touch, in an interesting and entertaining way for children. 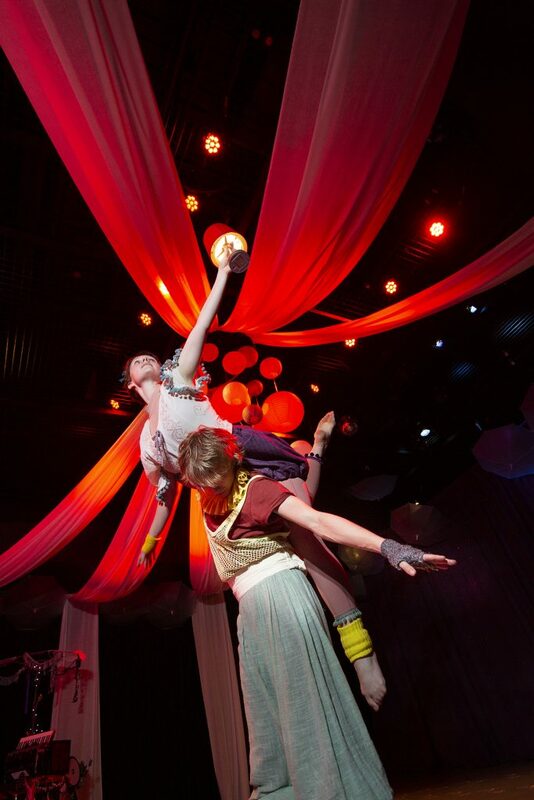 FIVE challenges the norm by blending live music, movement and clowning in an immersive promenade performance. Dance for young audiences, particularly contemporary dance, is limited within the UK. 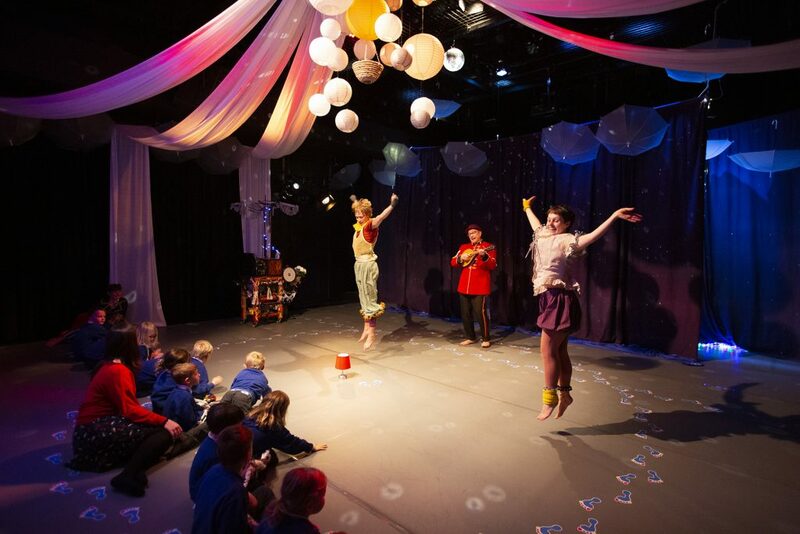 I am personally delighted and find it remarkable that children from across the Tees Valley and County Durham can come to The Hullabaloo and experience high-quality contemporary dance theatre at such a young age. With shows such as FIVE, children can gain an appreciation of dance not just as an activity but as an expressive, creative and artistic form. Don’t miss out, come and watch the last performances today and tomorrow. FIVE, for children aged 3 to 6 (and their grown-ups), is a playful exploration of our five human senses through dance, movement and live music. This warm, funny and inclusive show creates an intimate atmosphere where the children and families are up close with the performers while music fills the air.